A family friend of mine is an MD (surgeon). He works at both University Hospitals in Cleveland Ohio and The Cleveland Clinic Hospitals. I asked him to do me a favor and do a little research at both of these hospitals regarding the number of times anyone has ever been admitted into either hospital suffering from over-exposure to Ozone caused by a home or room air purifier such as you have described. Also I have read that ozone gas is always part of the air that we breathe outside our homes. Apparently, along the ocean and up in the mountains it is even stronger. Frankly, I and most people I know love ocean and mountain air! If there is ozone in the outside air why can't I have some inside my home. I'd love to have my house smell like ocean or mountain air! Especially since I see no evidence of people dropping like flies because they got over exposed to their Orick or Aran Air purifier? I would appreciate hearing from you asap regarding this matter because I am in the market to purchase an air system for my home here in Cleveland and another in Tampa Fla.
Ozone isn't directly made by vehicles; however, exhaust gases like Nitrogen Dioxide (NO2) and other volatile organic compounds are photocatalyzed by sunlight into highly reactive Ozone gas at ground levels. One study indicates that asthma symptoms may worsen after thunderstorms as a result of lightening-induced elevated Ozone gas levels. Ionic air cleaners induce the same transformation of oxygen, just on a much smaller yet still dangerous scale. Did You Know Copy Machines Emit Ozone? Most copy machines (or Xerox copiers) utilize electrostatic charging of a cylinder during what is known as the xerographic process". The resultant ionization of Oxygen (O2) results in Ozone (O3) release by the copiers. This is one reason why photo copiers are sometimes implicated as contributors to Sick Building Syndrome and Building-related Illness. Good thing they named them the Great Smoky Mountains! The average visibility in the park has now fallen to just 9 miles during summer months compared to 93 miles in natural conditions. On the worst days when particulates and Ozone from automobiles and industrial sources is highest the average visibility drops to less than one mile. Great Smoky Mountains National Park monitoring stations record more damaging nitrogen and sulfur compounds than any other site in North America! Some of the highest elevations in the park (like Mt. Mitchell in North Carolina) are periodically shrouded in acidic mist with a pH as low as 2.0, while the average acidity of rainfall (~pH=4.5) is up to 10 times more acidic than normal! The poor air quality found in the Smoky Mountains proves that air pollution and Ozone specifically is not a problem localized to just major urban areas. It's a very serious problem found throughout the United States and other countries as well. Thank you so much for contacting Home-Air-Purifier-Expert.com with your excellant questions and comments about Ozone gas! As far as hospital admissions go, it doesn't surprise me at all that there is no specific category implicating Ozone inhalation. Most admissions to hospitals due to Ozone inhalation would most likely be categorized by the effects rather than the cause. In many cases it is not clear that Ozone is the root cause since the symptoms of Ozone inhalation are the same for many different causes. As you'll see from the evidentiary studies outlined below, most Ozone-induced hospital admissions would be classified under asthma, non-specific respiratory distress, pneumonia, or chest pain. It's also unlikely you will just drop dead from Ozone inhalation directly, unless it's at such extreme levels that it displaces life-giving Oxygen and causes asphyxiation or triggers anaphylactic shock. I don't know of any cases where that has happened. However, pre-mature death from Ozone related pulmonary distress is suspected to occur especially if there is a pre-existing respiratory ailment or pulmonary condition. Death rate statistics and pollution monitoring in urban areas during periods of unusually high air pollution show that high ground-level Ozone does contribute to pre-mature death, especially amoung the risk groups listed below. In a study conducted in Belgium a relationship between 0.05 ppm Ozone, high temperatures, and the numbers of daily deaths was established. Elderly deaths were statistically elevated with 0.034 ppm Ozone for a 24 hour period. Medicare records between the years 1986-1989 also showed a correlation between elevated Ozone levels and respiratory admissions of the elderly. Significant increases in hospital admissions for pneumonia correlated to Ozone levels of 0.05 ppm over a 24 hour period. A 0.05 ppm level of Ozone is relatively low. However, when Ozone levels approach 0.125 ppm over a 1 hour period to 0.404 ppm over an 8 hour period the air quality is very unhealthy and sensitive people will experience severe respiratory symptoms and breathing problems. Recent studies have shown that at those levels pulmonary function during heavy excercise is impaired. Studies in Mexico City have also showed that levels of 0.17 to 0.25 ppm over a 1 hour period increases the occurance of respiratory symptoms like difficulty breathing, phlegm production, cough, and asthma in children. A study done in Atlanta, GA showed that Ozone levels in excess of 0.11 ppm over a 1 hour period increased the number of emergency room visits for asthma and reactive airway disease in children. At those levels of Ozone both children and adults reported increased progressively worse substernal pain, deep inspiration, reduction in vital capacity, and coughing. In Tennessee a study of 154 children aged 10-12 years old associated a 1 hour Ozone level of 0.082 ppm with an increase in asthma-related hospital visits. In the largest Ozone mortality study ever conducted death records for ~40% of the U.S. population over a 14 year span in 95 US cities showed that city deaths do indeed rise with O3 levels. people with pre-existing respiratory diseases like COPD (Emphysema), asthma, or chronic bronchitis. people who work or exercise outdoors. children, because their airways are smaller, their respiratory defenses are not fully formed, and their higher breathing rates increase their exposure. healthy individuals known as "responders" who experience health effects at lower levels of exposure than the average person (similar to those who suffer from Multiple Chemical Sensitivity (MCS). The common symptoms of Ozone inhalation reported to health care professionals would include general respiratory irritation, shortness of breath, chest pain, wheezing, coughing, reduced lung function, respiratory discomfort, asthma attacks, headache, and fatique. Long-term exposure can permanantly damage the lungs and inflame the lung lining. Even though the exact cause of the above symptoms may not be known upon admission to a hospital, what is known is that Ozone at ground levels is a powerful respiratory irritant and is a big problem in urban areas especially during the summer months from May through October. 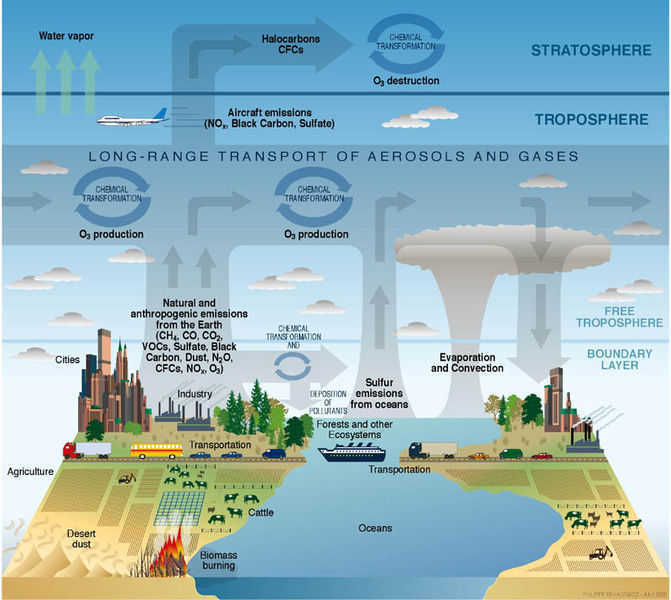 The higher temperatures, increased sunlight, and stagnant atmospheric conditions catalyze the formation of Ozone from such gases as Nitrogen Oxides (NOx) and hydrocarbon Volatile Organic Compounds (VOCs) at ground levels. 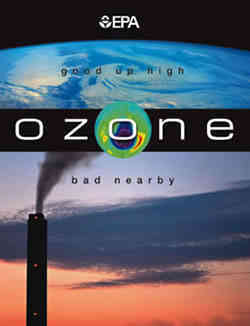 Ozone levels in industrialized nations have been rising annually by 0.5 percent to 2.5 percent. In Los Angeles, which is well known for its smog problem, ground-level Ozone has been measured in excess of 0.5 parts per million (ppm) which can be 20-50 times the normal Ozone levels. This concentration is very damaging to crops, natural vegetation, and animals (like human mammals). As but one indicator of crop damage expected from elevated Ozone consider that Scientists have observed up to 25 percent losses in harvestable soybean crop yields in O3 concentrations of 60 parts per billion. Crop yeild reductions seem to correlate closely with increased Ozone concentrations. For almost two decades prior to 1997, the federal air quality standard for ozone had been 0.12 parts per million (ppm) averaged over one hour, but tests carried out on healthy adults and children undergoing moderate exercise while exposed to lower levels of ozone showed a decrease in subjects’ breathing ability. In response to a lawsuit filed by the American Lung Association, the U.S. Environmental Protection Agency in July 1997 set a more protective ozone standard of 0.08 ppm averaged over an eight-hour period. Many of the electronic air purifiers in our list of O3 generators can produce Ozone far in excess of these levels and since homes today are fairly air tight the ozone can accumulate to very dangerous levels and can also persist for days. Many families are admitted for symptoms not even knowing what the root cause might be. Many people would never suspect that their home air purifier could do more damage than good because they assume the government protects them from all hazards. However, this just isn't true for air purifiers and many other things either (ex. many household chemicals and toxins in food, water, and common household products). When one considers how pro-corporation OSHA, EPA, and FDA regulations are one will understand the protective "big brother" ellusion. Home air purifiers are not regulated for ozone emmisions because they fall through the crack which exists because Ozone emmsions by these home appliances aren't regulated by any government agency. Worse yet marketers use this loophole to differentiate their ozone air purifiers from all the others, hyping the few benefits of ozone (odor reduction) yet ignoring the over-riding health consequences. I expect groups such as the American Lung Association will make sure air purifiers are soon regulated for Ozone emmisions. There have already been legal actions begun against many purifier manufacturers for fraudulant claims and damages due to the Ozone they emit. The U.S. EPA and the California Air Resources Board have also issued advisories discouraging the use of these Ozone emitting machines. It is important to note that outside ozone levels on the worst smog alert days can match or be exceeded by the dangerous levels that some ozone generators and ozone emitting electronic purifiers can produce. In fact, researchers at the University of California, Irvine, confirm in the May 2006 issue of the Journal of the Air & Waste Management Association that some ionic or electronic air purifiers used in small, poorly ventilated areas can creat Ozone gas concentrations that exceed regulatory standards. In the study, ozone levels reached levels higher than 350 ppb, which would trigger a Stage 2 smog alert if it occurred outdoors. Also important to note is that despite manufacturers claims many Ozone air cleaners will not remove particles from the air. They may reduce odors because Ozone oxidizes some odor causing gases, but that is an aesthetic benefit that marketers depend on to keep their ozonators selling. Without a good quality HEPA filtration system many of these Ozone generating purifiers will make asthma worse due to the added Ozone and lack of particle removal. Which is more important good smelling air or clean air? As for the fresh scent of mountain air, I'm a big fan of that too especially while up in the Blue Ridge Mountains of upstate SC hiking the Foothills trail around Lake Jocassee or doing a little trout fishing on the great Chatooga River (yes the same one of Deliverance fame)! 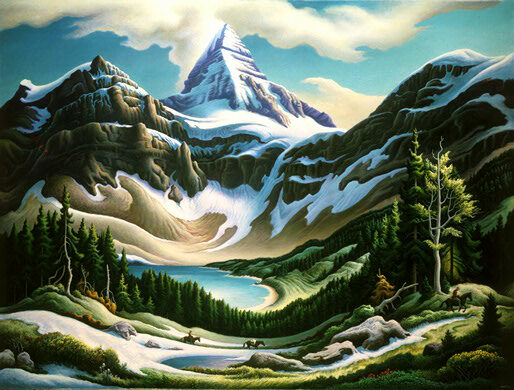 Incidentally, did you ever notice how food seems to taste better in the mountains too? It's my theory that this may be due to all the photosynthesis going on in all the billions of leaves typical to forested wilderness areas. One of the by-products of photosynthesis is life-sustaining oxygen (O2) which has one less molecule of oxygen than Ozone (O3). Oxygen is essential for our taste mechanism. If you don't believe me, pinch your nose and eat something. You won't taste it, just like when you have a cold with a stuffy nose. In contrast to diatomic oxygen (O2), Ozone will actually deaden your sense of smell and probably taste too over time. So don't confuse fresh mountain air with any benefit of Ozone. In this region which is part of the southern Appalachian Mountains, Ozone does build up to such high levels in the Great Smoky Mountains National Park during summer months that the NFS has implicated it (in addition to severe acid rain) as a major source of much of the damage being done to Smoky mountain national forests. Studies have also shown that Ozone may harm the health of hikers who engage in strenuous activities during periods of elevated Ozone pollution in the park. So if that "mountain fresh smell" were due partially to Ozone that may not necessarily be a good smell in so far as health is concerned. Experiments and surveys have proven that mountain Ozone pollution is causing visible leaf injury to 30 species of vegetation at the park such as black cherry, yellow-poplar, and tall milkweed. O3 damage to Cone Flowers planted in a special "ozone garden" in the Great Smoky Mountains National Park has also been documented. Elevated Ozone has been correlated to the tell-tale signs such as yellowing and crinkling of leaves of such Apalachian flora as the cut-leaf coneflowers (Rudbeckia laciniata). The Ozone bio-monitoring garden located at Purchase Knob in the Smoky Mountains has also confirmed Necrosis (dead leaf tissue), Stipling (purple or brown spots not covering leaf veins), and Chlorosis (yellowing)of Crownbeard leaves. The reactivity of Ozone gas is due to the very unstable Ozone molecules' affinity for oxidatively reacting with organic molecules of many origins. The third oxygen atom can detach from the Ozone molecule and reattach to molecules of other substances (like in the mucous membranes of lungs or in carbon-based plant biomolecules like those at the heart of photosynthesis like Chlorophyll) to change their chemical structure. In one popular school experiment developed by the the National Center for Atmospheric Research students can even extrapolate relative Ozone concentrations based on how quickly O3 attacks rubber bands. It takes surprising little Ozone to initiate cracks and pits in rubber and plastics. Despite possible high levels of summertime ozone in more stagnant mountain valleys, this shouldn't necessarily be associated with the "fresh scent of mountain air". As I said that could be due to higher concentrations of oxygen plus pleasant odors from surrounding biological factors like from volatilizing pine terpenes, aromatic flowers, or aromatic compounds from humus, wet pine needles, or even mosses and lichens. Plus, In my opinion, it seems mountain air is "freshest" in the winter when Ozone levels are lowest. This may also be because there are less detectable odors due to lower biological activity (due to reduced temperatures and lower light) and the air is usually much less stagnant during winter months. However, I'm not absolutely sure that Ozone may not play a part in the "fresh smell of mountain air" because Ozone has been reported to result in a somewhat "sweet" smell. Additionally, some meteorological conditions such as when air is vertically displaced by thunderstorm convection has been known to pull Ozone down from the Stratosphere to the troposphere which includes ground level. Therefore, in a similar fasion the orographic effect of convection up the slopes of mountains might possible displace air and pull Ozone from higher levels in the atmosphere to lower levels. However, in most cases increased convection and upsloping winds will help to flush stagnant air and reduce ambient Ozone gas concentrations. Ozone symptoms are usually worse at high elevations when polluted air gets trapped in between mountain peaks during at atmospheric phenomenon known as inversion. That sweet smell of Ozone is one of the reported superficial benefits that keep people swearing by Sharper Images Ionic Breeze purifiers despite its alleged lackluster cleaning performance. Even with the addition of Engelhard corporation's Ozone eating Premair catalyst, an appreciable amount of Ozone was still emitted by the Quadra according to Consumer Reports tests. It seems like Sharper Image is trying to have their cake and eat it too by advertising the addition of an Ozone-eating catalyst to quel concerns over ozone, even though levels of Ozone emitted by the Quadra were still relatively high. Maybe this is intentional so the odor reduction properties can be maintained as a selling point while giving the impression of zero ozone emmisions by touting the ozone eating catalyst addition. Perhaps they should call it "Ironic Breeze"! Your best bet is to stay away from the heavily marketed ionic air cleaners as seen on TV regularly in commercials and informercials. There's a reason they are giving away partable refrigerator purifiers and cheap vacuum cleaners. Their air cleaners just aren't very effective at all. Don't let them bait and switch you! Also keep in mind that because of their use of internal electrostatic generators, collection plates, or charged wires the resultant ionization of Oxygen often means that those as seen on TV models are emitting Ozone gas into your home. The best air purifiers will be certified Ozone-free, have the ability to capture volatile organic compounds (VOCs), and will include true HEPA air filters certified to remove near 100% of the finest lung penetrating particles. The top of the line home air purifier with all of the above criteria is the Swiss-made IQAir models. Also, the Japanese-made Plasmacluster is one of the few ionic air cleaners on the market today that actually has powerful cleaning abilities due to is multi-stage filtration including pre, HEPA, gas-phase, and a new technology known as Hydroxyl Radicals which aren't nearly as dangerous as Ozone. Both brands are effective against both fine lung-penetrating particles and VOC, with little to no Ozone emitted. There is evidence the Plasmacluster hydroxyl radicals may even reduce gas-phase air pollutants at their sources such as paint, press-wood, carpet, insulation, or plastics. 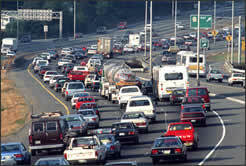 For more information visit Medlineplus which has an extensive collection of Ozone information.